Zahid Shah performing a free style act. A new sport, Parkour has been introduced by the younger generation in Kashmir while learning it from YouTube videos. Inspired by its practitioners (traceurs) in Gaza, here in this conflict ridden state youngsters find catharsis in it. So next time if you find young boys jumping, climbing and walking in air in your neighborhood; don’t get surprised! They might be practicing Parkour and free running. Rather than calling it a sport, its traceurs prefer calling it an art where in they combine gymnastics, acrobatics, swinging, mid air somersaults, climbing, running and jumping. In January 2012, Zahid Shah, 21, a final year commerce student, after watching an episode about this art on National Geographic, got inspired and introduced Parkour in Kashmir. But it did not happen instantly. “It took me almost a year to practice it myself before I could have introduced it among my friends,” says Shah. “We have a dumping site in our locality and that was probably the only open space where I could practice. I used to get up very early in the morning and practice all beginner steps that I used to learn after watching the videos repeatedly. I learnt it while imitating its traceurs,” Shah says he finds catharsis in it. Shah feels that Parkour helps one get reconnected with the nature. “My generation is addicted to social-networking sites. They need to get out and feel the nature. There is a world beyond mobile phones, go out and explore it,” says Shah. Presently, Shah is training around 15 traceurs and occasionally he gets 100’s of students who want to learn free jumping, as it amuse them. The founder of Kashmir Free Running and Parkour Federation (KFPF) says everyday they get hundreds of messages on their facebook page about learning this sport. In Parkour there are chances of getting injured but Shah proudly says that none among his students was ever injured. But Shah once injured his head when he lost his grip while practicing a wall-flip. It was this injury that made Shah, who has a modest upbringing, cut down his expenses, take part-time odd jobs, and save rupees 8, 000 for a Parkour specific shoes. Shah, who has a background in martial art says, initially he used to practice alone but with time, his friends developed an interest in Parkour too. Now Shah and his friends practice at Badam Weer and other spacious places in Srinagar city. Shah says this art involves reinterpreting the surroundings in terms of angles and surfaces; making a traceur efficient and quick with his movement. These traceurs propel their body in such a way, which seems to a lay man as if they walk in air. But without any infrastructure available for Parkour enthusiasts in Kashmir, they are using waters of Dal Lake as their practice mats to avoid injuries. “It needs a proper gym for practice which is not available here,” says Shah. For five hours a day, Shah and his team hone their skills at lone martial art gym located at Soura, Srinagar. But without any push from government this sport has remained limited to its intermediate level only. “To go to next advanced level we need a gym and facilities like tables etc.,” says Shah. 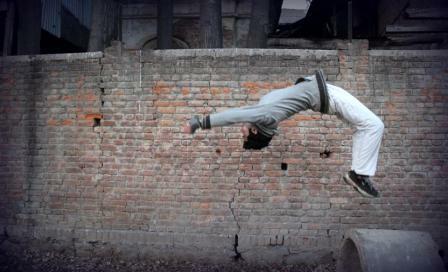 Shah is hopeful that Parkour will soon come out of the dark allies and be a recognised sport in Kashmir. “I met Taj Mohiuddin (former sports minister) who said since it is not a recognised sport so government cannot help,” says Shah. “But when I told him there are other sports in the state which are not recognized, he wrote a note on my application instructing sports council to look into the matter,” says Shah. Interestingly, officials at sports council told Shah to get it done from WFPF, which is in London. “And since then we are waiting,” says Shah. Shah says there is no age limit in learning this art and he says Parkour is going to be the future of martial arts.